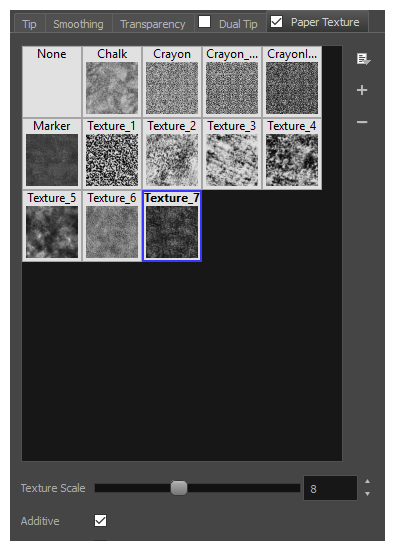 You can change the way the paper textures are displayed in the paper textures list of the Brush Properties dialog. Click on the Paper Texture menu icon . Small Thumbnail: Displays paper textures in a grid of small thumbnails. Large Thumbnail: Displays paper textures in a grid of large thumbnails with their names. The default view setting. List View: Displays paper textures in a list, with their name on the left and their texture on the right of each row.